Pixable does smart things with sorting through the photos and videos that your friends share across a range of services, helping to make sure that you don’t miss anything important. Available as an app on Facebook, the iPhone and iPad, we’re fans of the ‘behind the scenes’ work it does to keep you up-to-date with the best of what your friends are sharing. 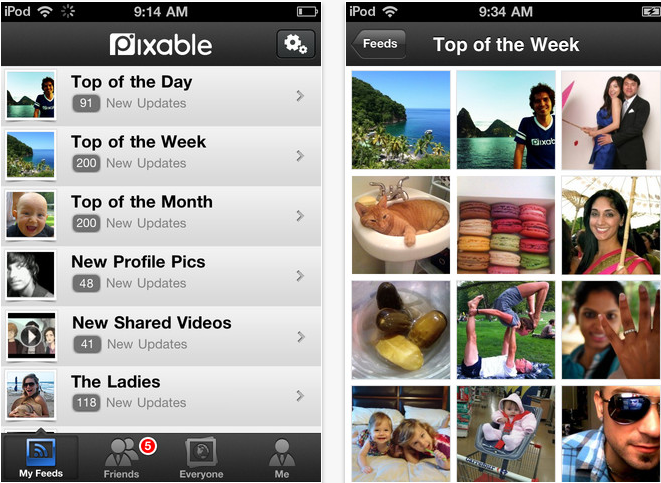 Now, Pixable’s iPhone app has received an update that makes it well worth a look if you’re yet to try it. First up, you can now watch your friends’ latest shared videos right in the app. A new, more streamlined design makes it easier and faster to use, featuring a ‘Me’ section that allows you to browse your own Facebook photos quickly and easily. Taking the app beyond just your friends, the new ‘Everyone’ section takes the app beyond just your friends, allowing you to view photos shared by people around the world under a range of categories such as Entertainment and News. The updated app does a great job of compressing the key features from the Facebook app into the palm of your hand. It’s available now on the App Store as a free download. Read next: Microsoft agrees deal with Jinni, movie recommendations coming to Xbox and Windows 8?